The Malta Council for the Voluntary Sector is hosting a photographic competition entitled “Volunteers # Make a Difference”. This photographic competition is intended to highlight volunteers and their work. The photos must include volunteers in action in the sectors mentioned in the application form and will be based on 2 categories, monochrome and colour. Each contestant can enter a maximum of 3 photos in each category. 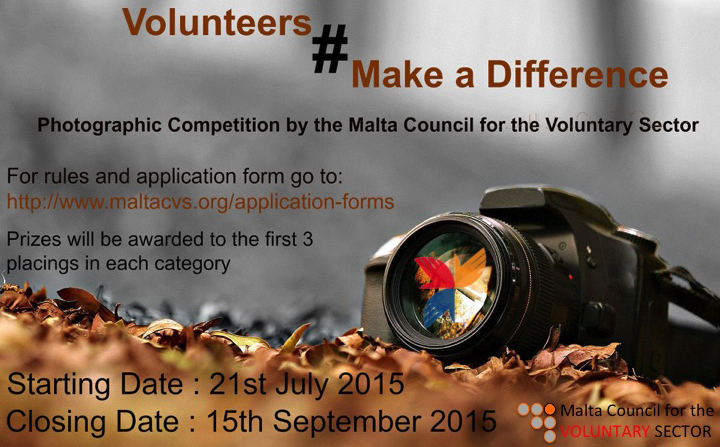 Contestants must send a hardcopy of their photos to the Malta Council for the Voluntary Sector, Volunteer Centre, 181, Melita Street, Valletta, VLT 1129 and a soft copy to mcvs.msdc@gov.mt by not later than the 15th of September 2015. The photographs which will place in the top 10 in each category will be held and displayed in the Volunteer Centre in Valletta. These may also used in MCVS publications where credits to the photographer will be given. Prizes will be awarded to the first three placing in each category.